"We've opened a new window to splitting real water, not just purified water in a lab." There exists a wide range of renewable energy sources support our increasingly energy-intensive lives as fossil fuels are ultimately phased out. One of these new potential sources of energy is as promising as it is strange. 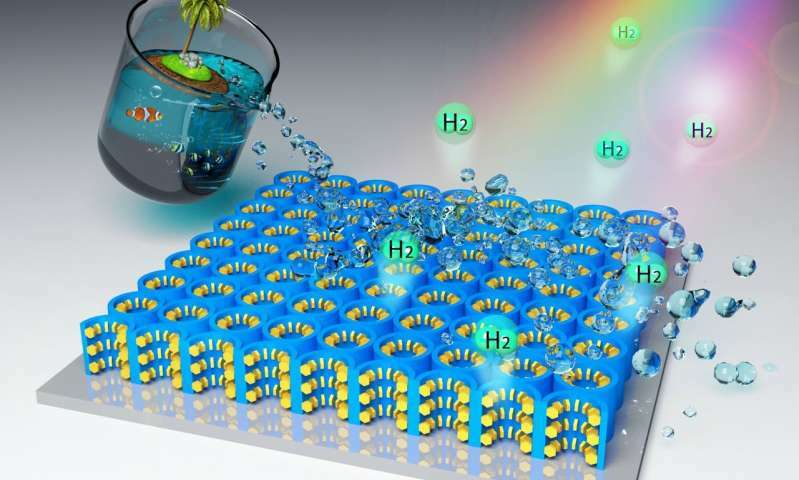 University of Central Florida (UCF) researcher and assistant professor Yang Yang has developed a breakthrough hybrid nanomaterial that uses the power of an existing green energy source, solar energy, to turn seawater into hydrogen fuel. A faculty member of both the NanoScience Technology Center and the Department of Materials Science and Engineering at UCF, Yang’s breakthrough has been 10 years in the making. Current materials being used to create hydrogen fuel are fairly costly and not all that efficient — a sharp contrast to Yang’s new method. To create hydrogen fuel, however, you need a photocatalyst — a material that triggers a chemical reaction when exposed to light. But considering the corrosive and difficult nature of seawater, Yang needed a photocatalyst that was uniquely durable, which is where the hybrid nanomaterial came in. The nanomaterial began with an ultrathin sheet of titanium dioxide (the most common photocatalyst), into which nanocavities were carved. Nanoflakes of molybdenum disulfide, a 2D material as thick as a single atom, then coated these cavities. This material is nearly twice as effective as most other photocatalysts because instead of converting a limited range of light into energy, it can turn ultraviolet-visible to near-infrared light wavelengths into energy — a much wider range. Hydrogen fuel, like everything, has its pros and cons. On the positive side, it’s only emissions are water vapor, a drastic difference from what is produced by fossil fuels. In terms of vehicles, hydrogen fuel cells have about double the fuel economy of traditional gasoline. Additionally — and most obviously — hydrogen fuel is renewable and can be created in abundance. However, until now the process to create hydrogen fuel has been considerably expensive, and there is a lack of existing infrastructure to support its use. The main issue with hydrogen fuel is that current methods for creating it are not only inefficient and costly, they often use nonrenewable natural gas. But this process has the potential to eliminate many of the issues presented by the use of hydrogen fuel. If this nanomaterial is used on a larger-scale, the process could help generate a substantial amount of green energy, replacing fossil fuels and pushing us forward in the fight against climate change. In the immediate, it could also help bolster Florida’s economy: with abundant sea water and the state’s current efforts to recover from the devastation of Hurricane Irma, such a boost would no doubt be welcomed.